Financial Meltdown on the Way?? The interesting to note the increasing incidence of warnings of dire consequences that are now coming from establishment sources. That the global financial house of cards will fall seems unavoidable, the big questions are timing and the exact nature of the meltdown. You can be assured that governments will, as always, try to prop up and rescue the banks. That means they will try to shift the burden of their failure to the ordinary citizen, the worker, the small business person. Our assets may be wiped out while our debts remain. The unprecedented global expansion of credit over the past few years seems to be the last gasp effort to keep a flawed and corrupt system going. What seems likely is a massive global depression caused by cascading failures of financial fantasies (derivatives, interest-only mortgages, inflated real estate prices), exacerbated by banks calling in loans and restricting credit to legitimate businesses as they continue to fund government deficits to finance war, waste, and transfers of more wealth to the wealthy. The silver lining here is that crisis always brings with it opportunity. In this case, it’s the opportunity to implement structures of exchange and finance that are more honest, democratic, and equitable. We’re much better prepared to do that now than we were in 1932. However, his hope of using the ruble or any other manipulated political currency to replace the dollar falls far short of what is needed. I am proposing that independent nations in the Islamic world and Latin America spearhead the formation of a network of independent credit clearing unions that will use an objective standard unit of account for pricing. They may start with a gold or silver unit, then shift to the composite commodity standard that I proposed in Part III of my book, Money and Debt. When it becomes generally understood that money is nothing more than “turnover credit,” and that a far better payment system can be created around the process of credit clearing, then it will be possible to make a rapid shift to a new exchange paradigm that will bring a sustainable, peaceful, and environmentally friendly global economy. 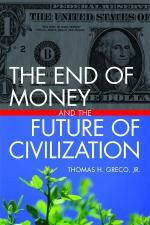 This entry was posted in Developing Alternatives, Global Economy. Bookmark the permalink.